Taste. Sample local, regional, continental and international cuisine at The Kitchen Table. Epicurean at every turn, its original menu blends global favorites ranging from curry to gourmet pizza and salads. 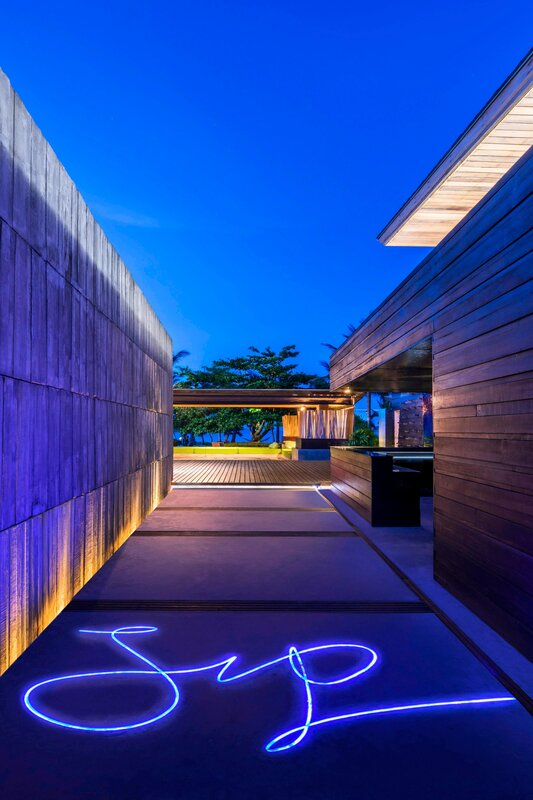 Or try Namu, where contemporary Japanese cuisine with a worldly twist is presented in a dramatic, creative fashion. Sip. Recline with a colorful cocktail at the W Lounge. Mix and mingle indoors and enjoy iconic views from the outdoor terrace. Or head to SIP to toast the island’s spectacular sunset. After dark, WOOBAR® alights with live DJ beats and custom concoctions. 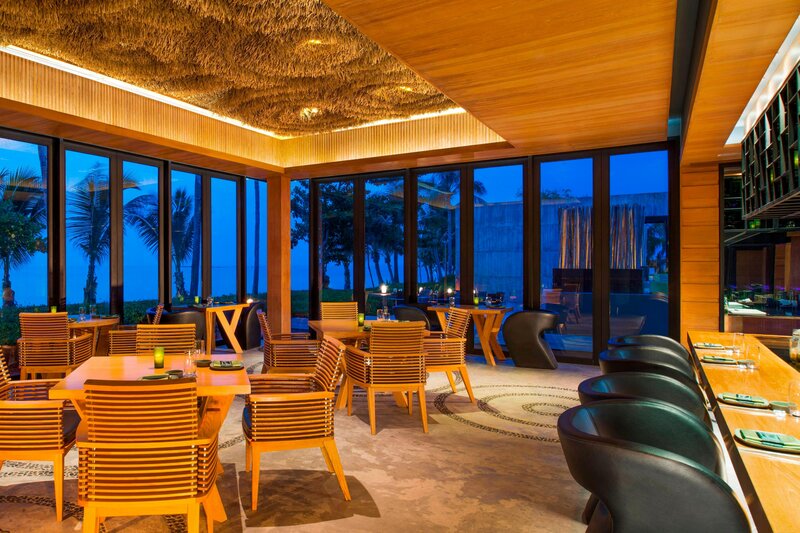 Of course, Tonic Bar offers innovative sake tonics along with health-inspired refreshments and snacks. Recharge. Make yourself at home. Our 24-hour In-Room Dining service brings gourmet offerings from our restaurants to your doorstep while our On the Move Picnic Hampers for Couples—from Bubbly Breakfasts and W Deli selections to a local assortment—offer to-go options. Dining guests receive complimentary WHEELS(SM) Valet Parking. It&apos;s up to you. From local Thai favorites and regional specialties to gourmet pizzas and buffets inspired by global gastronomy, The Kitchen Table fuses top flavors from all over the world. Discover daring Japanese cuisine at Namu. Fusing the freshest seafood available with epicurean excellence, contemporary décor and indoor or outdoor seating, it offers a truly dazzling dining experience. An iconic bar with an iconic view: WOOBAR® delivers WOW by day and by night. Chilling in the midst our W Music Curator&apos;s tracks, innovative lighting and nibbles. 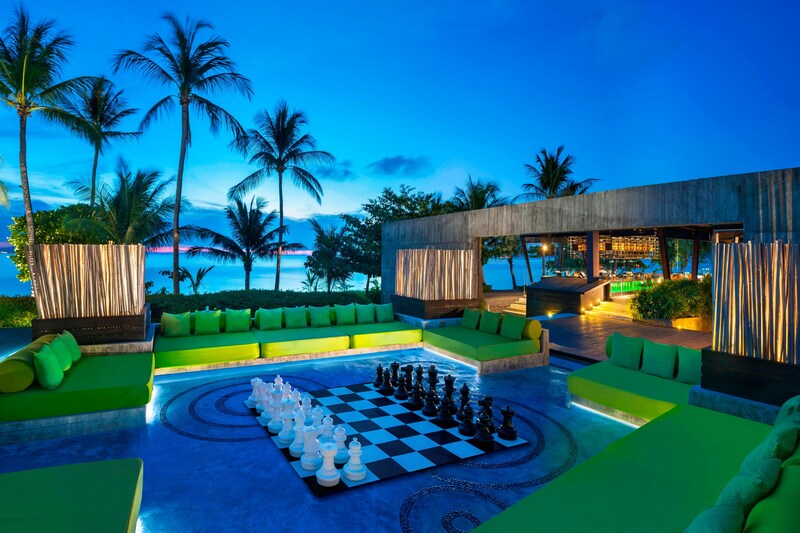 Welcome to not-your-ordinary lounge. We serve a variety of custom cocktails and light bites. Meet for a chat, set up one of the specially designed board game or tap into the high-speed internet. SIP is the destination sunset bar with a stylish, easygoing open-air setting and spectacular water views. The ambiance is relaxed and sophisticated with low-back resin chairs, beautiful rich tropical hardwoods offset by oversized lamps. We are redefining the way we live, work and play – relaxing by day, celebrating at night – and accompanied by new friends, and delicious food and drink. Experience the next level of BBQ Dinner featuring BBQ favorites from a selection of ‘Hot Over The Coals’ to ‘A Little on the Side’ and ‘Sweet Ending’. Just because you’re getting too comfy in your room doesn’t mean you don’t get to indulge. Just a buzz brings our gastronomic offerings to your door step. Romantic dinners as the sunsets on the beach, candlelit affairs in your private garden, breakfast in bed or one of our specially designed events for two. However you like to dine, we&apos;ll make it happen. Sweet Spots offer a wide selection of soft drinks and ice-cream for in-house guests. Laze around on our beachfront and feast on scrumptious dishes prepared fresh on our Beach Grill. Sample freshly shucked Fine de Claire oysters, feast on delicious barbecue dishes and enjoy fresh-tossed salads or delectable burgers. The 2 Fishes is the new Italian Restaurant in Fisherman&apos;s village with a range of traditional and modern dishes. Full Moon provides excellent contemporary dining options from their extensive menu, ranging from innovative pastas to seafood and other premium cuts. Our great concept of home living café style with the philosophy of serving the creativity products from a great food, homemade bakery, pastry to an excellent coffee. Laze in our super-soft bed and stay worry-free about missing breakfast; W’s signature breakfast feast is served until noon! Every Sunday from 6:30 am – 12:00 pm. 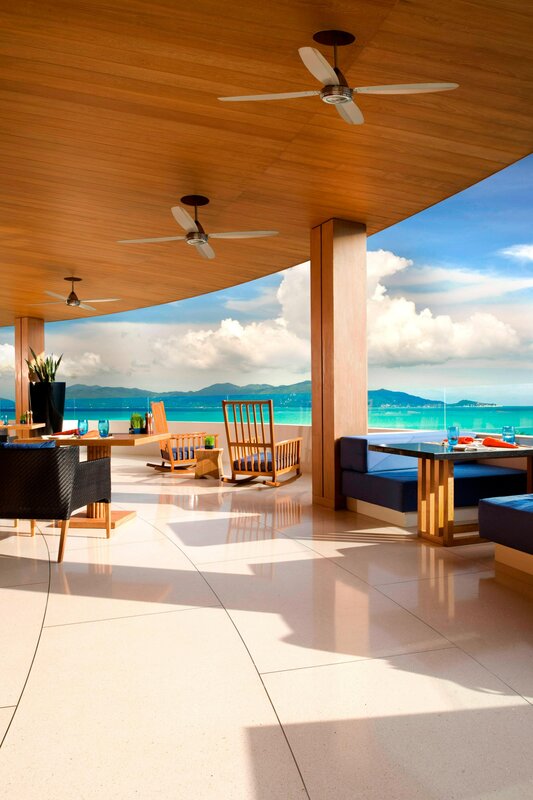 W T-TIME W Koh Samui takes afternoon tea to the next level with W T Time. 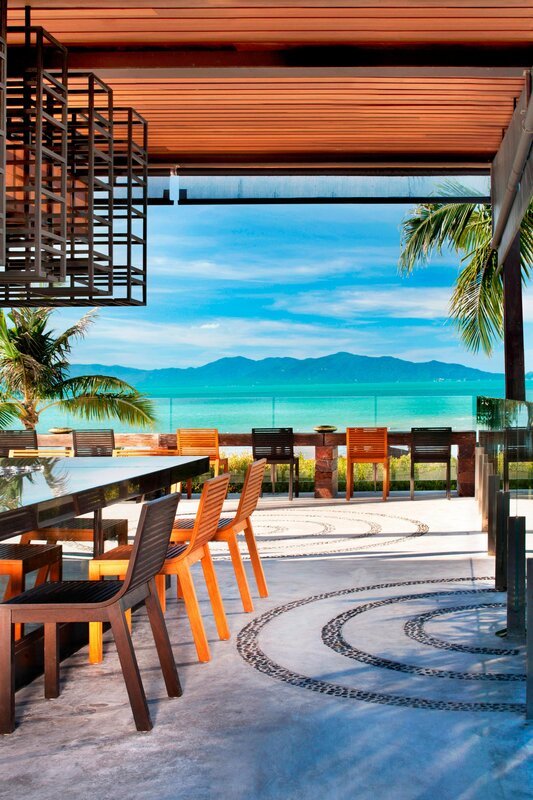 Spectacular views of Koh Samui’s Maenam Beach and Koh Phangan are complemented by innovative sweet and savory culinary creations and the ﬁnest of tea selections. 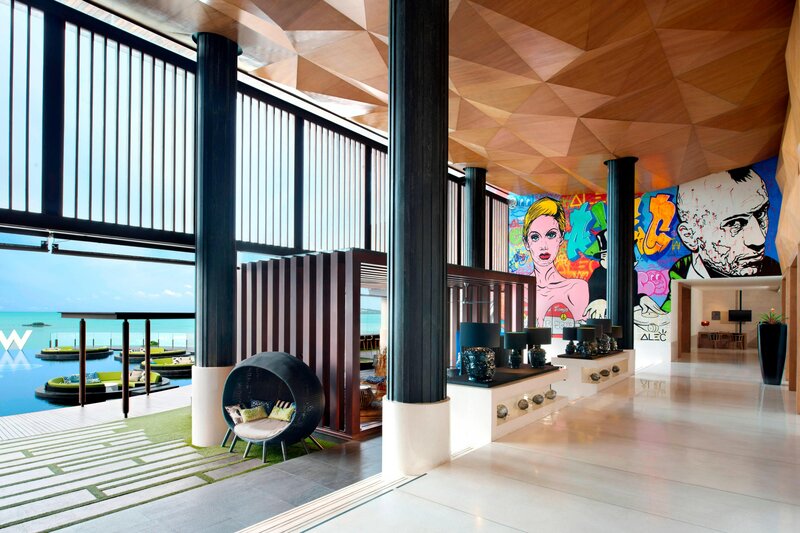 W T Time is priced at THB 2,200++ per set for 2 people. Imagine your private romantic dinner at the W Beach for just the two of you; a candlelit setting with a six or seven-course Japanese-inspired menu. Gain insider access to the art of preparing Sushi, Sashimi and other Japanese favorites side by side with the chefs from our acclaimed signature restaurant, Namu. Get behind the scenes and have an one-on-one cooking session with one of our chefs and learn how to prepare food, W style. • Lunch after class with a complimentary glass of wine and the food you worked so hard to prepare. THAI FOOD LOVER? Experience your own customized 4 course Thai sharing menu in the heart of the kitchen. It’s hot and loud but it’s the ultimate insider access to food from the wok to your plate. Maximum 4 persons with a 24 hour notice period.